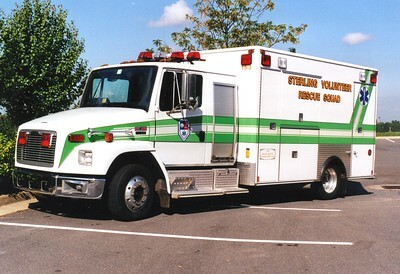 Rescue Company 15 - the Sterling Volunteer Rescue Squad operates Stations 15, 25, and 35 in the Sterling area. Station 15 shares quarters with Sterling Fire Station 11, Station 25 shares quarters with Fire Station 18, and Station 35 with Fire Station 24. 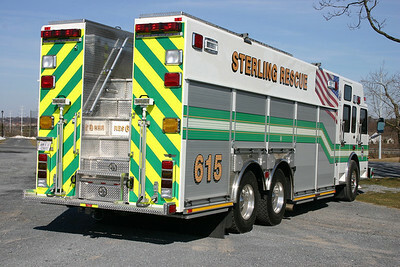 The following photographs are Sterling Rescue Station 15 apparatus. 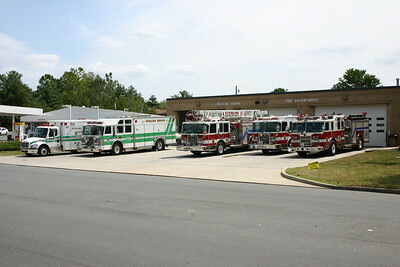 Sterling Volunteer Fire Company - Loudoun County Station 11. 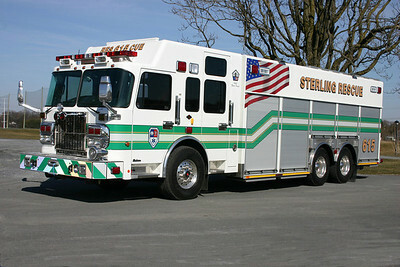 Sterling Rescue (Company 15) also shares this station. "Large" describes Rescue 615 from Sterling Rescue, a 2010 Spartan Gladiator built by SVI. These photographs of Rescue 615 were taken just after the heavy squad was delivered to the dealership in Winchester for final delivery preparations. Photographed at the Winchester golf course with no threat of golf balls since it was quite cold. Rescue 615's Officer side. 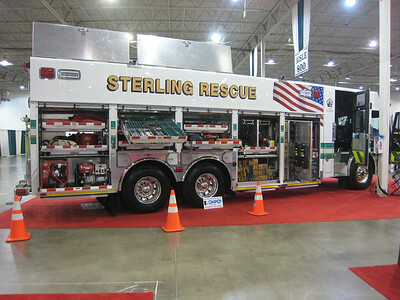 A photograph from this photo session of Sterling's R-615 appeared in the July/August 2010 edition of Fire Apparatus Journal. A rear view of Rescue 615. The stairs up lead to large "coffin" style compartments and a nice observation area. 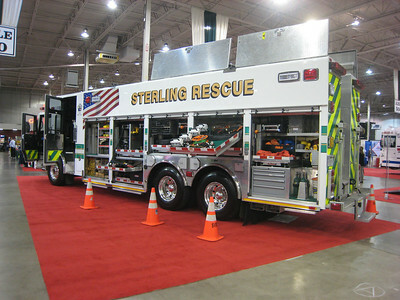 Rescue 615 as displayed at the 2011 Fire & EMS Expo in Chantilly, Virginia - December, 2011. Driver side. 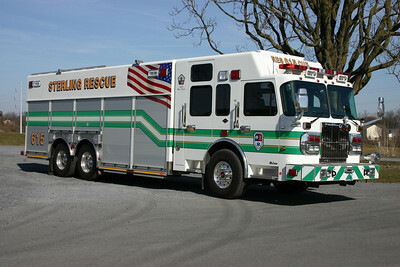 Rescue 615 as displayed at the 2011 Fire & EMS Expo in Chantilly, Virginia - December, 2011. Officer side. 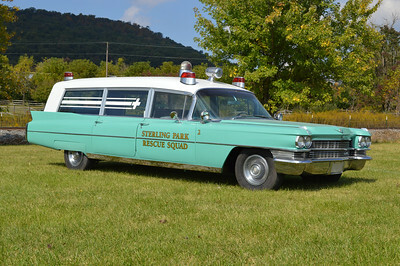 To celebrate the 50th anniversary of the Sterling Volunteer Rescue Squad, a "top secret" restoration occurred that was known by a small group of department members. 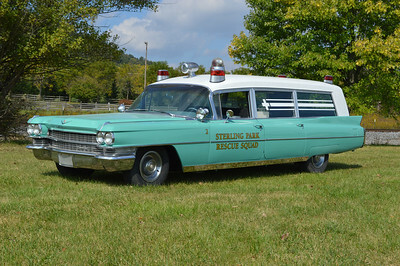 Shortly after the Sterling Park Rescue Squad was established, they purchased a 1963 Cadillac/Miller Meteor ambulance from the McLean Volunteer Fire Department in Fairfax County. In 2013, efforts were made to locate the old Cadillac however they were unsuccessful. A 1963 Cadillac/Miller Meteor was found in another part of the country in a junk yard. During 2013, the Cadillac was towed to Keplinger Repair in Winchester, Virginia and a complete restoration begun to make the Cadillac exactly as it looked while in service in Sterling Park. 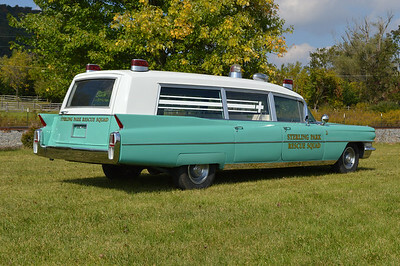 A rear view of the Cadillac just after the restoration was completed by Keplinger Repair in Winchester, VA.
Sterling Volunteer Rescue Squad's 50th anniversary was celebrated during October of 2014. The restored Cadillac was delivered to the department during the celebration. Command 615, a 2009 Chevy Suburban. 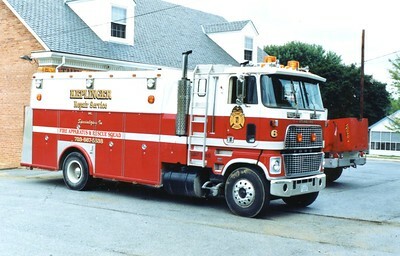 Old Squad 15 was a 1990 Duplex Vanguard/Saulsbury. In 2001, it was returned to Saulsbury for a rehab. 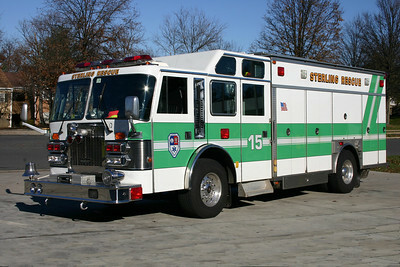 Squad 15 was sold in 2011 to Pooler, Georgia. 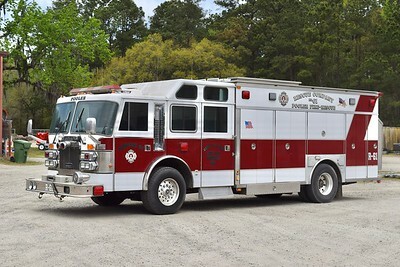 Pooler, Georgia, Rescue 61 - a nice 1990 Duplex Vanguard/Saulsbury. Photographed while out of service, most of the equipment is stripped and it is waiting to be traded in. 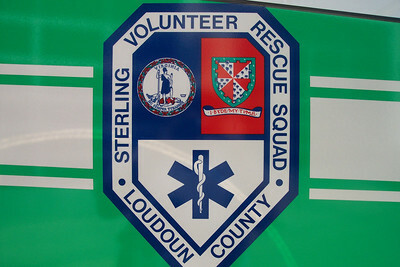 Pooler acquired the truck from the Sterling Rescue Squad in Loudoun County, Virginia, in 2011. Keplinger Repair Service's former '6', a 1981 Ford/1975 Swab. 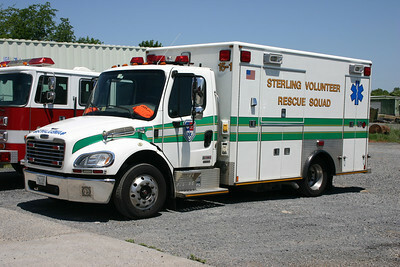 Former Sterling Rescue Squad (Loudoun County), Virginia. 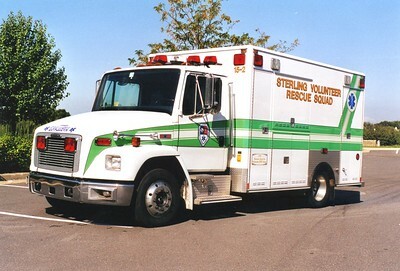 Sterling Rescue operates all monster medic's, with the exception of one four wheel drive Ford F chassis ambulance. The monster medics are all Freightliner's. 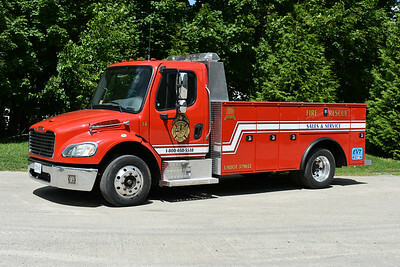 15-1 is a 2005 Freightliner M2/Medic Master and is one of two purchased that year. As an interesting side note, the Pierce engine in the background is an old 1985 Pierce Arrow that once ran at the Sterling Fire Department and is now privately owned. Keplinger Repair Service - Winchester, Virginia. "14" is a 2005 Freightliner M2/2016 Knapheide/Keplinger. 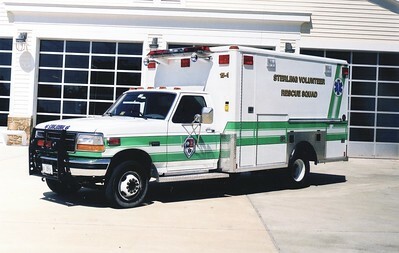 It was originally a Sterling, VA VRS monster medic. Former '15-1', a 1996 Ford F Super Duty/1991 Wheeled Coach. Rehab following an accident in 1995. 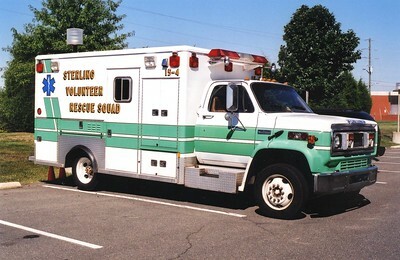 Former '15-1', a 1995 Freightliner 60/Medic Master. Donated to Kiln, Mississippi (Hancock County) in 2005 after Hurricane Katrina. Used as a command/tactical truck. 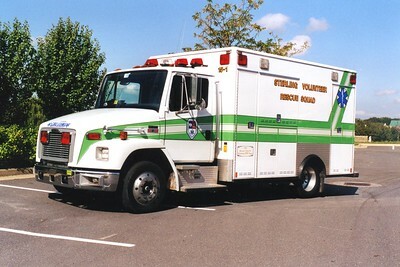 Former '15-2', a 1996 Freightliner 60/Medic Master. 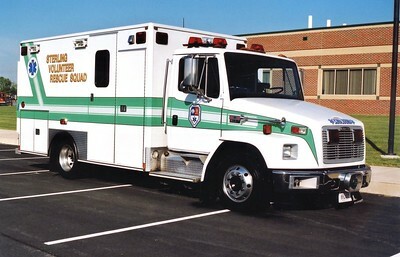 Former '15-3', a 1999 Freightliner 60/Medic Master. Used as an ambulance and a rehab unit. Former '15-4', a 2004 Freighliner 60/Medic Master. One of two similar units. 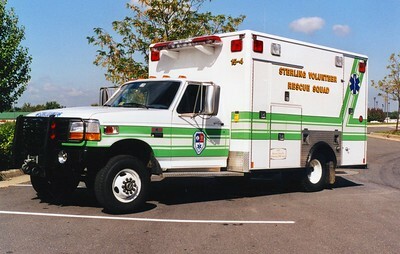 Former '15-4', a 1998 Ford F Super Duty/Medic Master. Donated to Monroe Tech School in Leesburg, Virginia, in 2007. 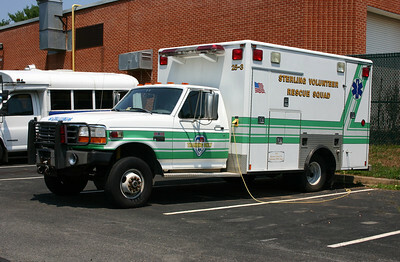 Former Ambulance 25-3 from Sterling Rescue was donated to Monroe Tech High School in Leesburg. Former '15-4', a 1989 Chevrolet 70/Wheeled Coach. Photographed in 2001 while out of service. This was one of two similar units.